UKTV’s on demand and catch-up TV app is to be made available on all Samsung TVs sold from 2015 onwards. 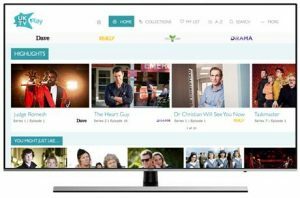 Featuring content from channel Dave, Drama, Really and Yesterday, the free UKTV Play app offers anytime viewing, access to box-sets, previews of new shows, exclusive content and personalisation with a dedicated ‘my shows’ section. Highlights this month include the full series of brand-new Judge Romesh and premieres of Dr Christian Will See You Now and Inside the Ambulance, which, until now, have only been available to pay TV customers. Episodes from the newest series of Taskmaster are also being previewed on UKTV Play seven days before they premiere on Dave. UKTV says that UKTV Play has grown significantly year-on-year since launching in 2014. Last year, it was the company’s fastest growing brand with direct-to-consumer views up 75% compared with 2016.